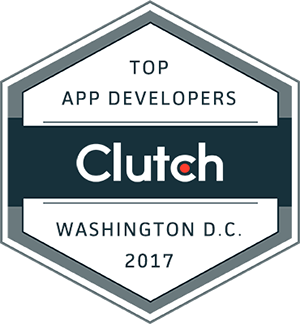 Shockoe Featured as a Top App Developer on Clutch! At Shockoe, our experienced team of engineers and designers are committed to delivering high-quality, impressive mobile solutions to our clients. With over seven years of experience in the field, we know how to create an app that is beautifully designed, easy to use, and that meets each user’s needs. Recently, our hard work was noticed by Clutch, ratings and review firm based out of Washington, D.C. Clutch published the results of their annual report on the Top Mobile App Development Companies in DC, and we made the list! Clutch’s methodology evaluates thousands of companies around the globe based on verified client reviews, services offered, work quality, and market presence. So far, we have received several positive reviews on Clutch. We are glad that our hard work is paying off and that our clients are impressed by our mobile solutions. We are able to meet each unique need of our diverse set of clients, and our solutions are flawlessly designed. We’re happy to see that our Clutch reviews reflect our efforts. We are excited to be featured as a top app developer on Clutch, and we look forward to being included in their ongoing research!